If the group is larger than 4 people gets special rate. 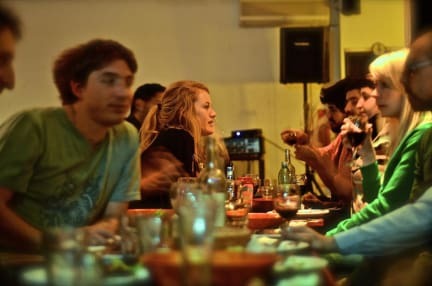 Art Factory San Telmo is a lively, affordable, fun and diverse hostel in the heart of the historic San Telmo neighborhood in Buenos Aires, Argentina. We want to make you feel happy and enjoy one of the best kept secrets in the world: Buenos Aires! 5)Theres art everywhere! Even in the kitchen and bathrooms! You can choose between private rooms with private or shared bathrooms and dorm rooms with 4 to 8 beds. All the ingredients of a great hostel are included in the rate: Wi-fi internet, Coffee-tea and juice served all day, Linen, Luggage storage, Tourist information and travel agency at the hostel, Open 24-hours front desk, Fully equipped kitchen, Book swap, Workshops, Tango and spanish lessons, Cultural activities and secret walks. Premium location: just 5 minute walk to Plaza de Mayo (Downtown), 2 minute walk to San Telmo Market and Fair, and just steps away from the Metro (subway). Check us out on the Google Map! Welcome to the Art Factory, much more than a hostel!